Wed, 4.29.2015. Some days I look around and something jumps out and adopts me for a week or so. "Me, me, me! Tell me my story." Today it is this big ring that I bought in 1992 in Peshawar, Pakistan. The dome is so thick that when I would wear it to work, people were sure that's where I kept my cyanide pill. But really, if it contains anything, it is likely a small prayer or blessing. The ring is Kazakh. Kazakhs are one of many Turkic peoples. They mostly live in Kazakhstan (a former Soviet republic), but also constitute significant minorities in China, Uzbekistan, and Russia. It's likely the pieces we found in Peshawar came through Afghanistan. Jewelry-making is in an important craft among the Kazakhs. Kazakh jewelers – zergers (from the Persian zer-zar, meaning “gold”) – worked alone, passing their mastery from generation to generation. Zergers produced a wide range of items, including: women’s accessories, details for costumes, toilet articles, tableware, pendants for decorating the wooden structure of the yurt, furniture, wooden and leather goods, musical instruments, weapons and harnesses. ...The jewelry art of the Kazakhs was developed and enriched by the constant movement of nomads through the huge space of the Asian steppe, the dialogues between nations this engendered and the exchange of cultural values between peoples. 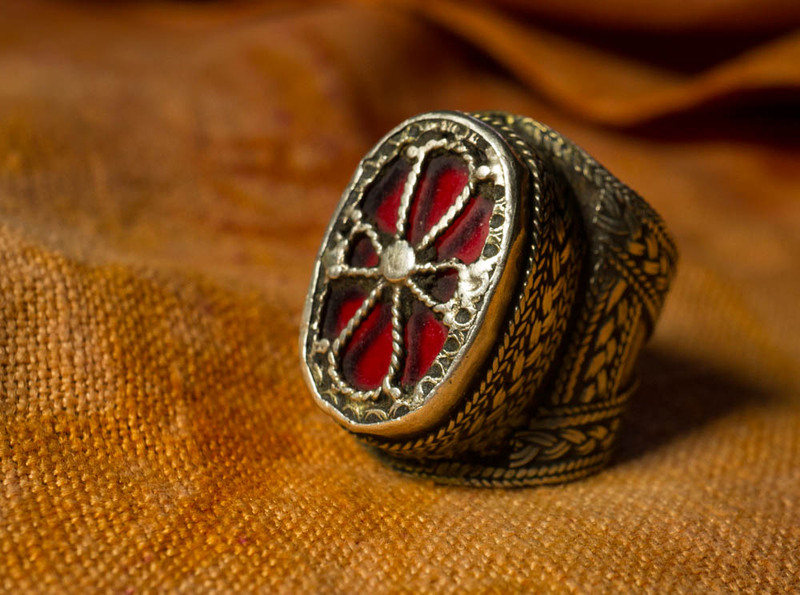 Our ring is silver (maybe coin-grade), with a filigree cross over red glass--an imitation of carnelian stone, which defends against the evil eye and brings youthful vigor and good spirits to the elderly [source]. The Kazakhs are Islamic, so the cross doesn't have a Christian significance. It may have the more ancient meaning--something like a crossroads and the four compass points or four seasons. Well, I don't know about the function of my ring in keeping the kitchen sanitary, but I do know I could sock someone in the nose with it if they were messing with my food.